When you get a dog you need to think about what happens when you leave them at home on their own. Not all dogs are happy to be left and will get upset. But do we even know if they are settled or not? I had a feeling Gus was OK when he was left on his own, but I didn’t know if he was or not. I do now! 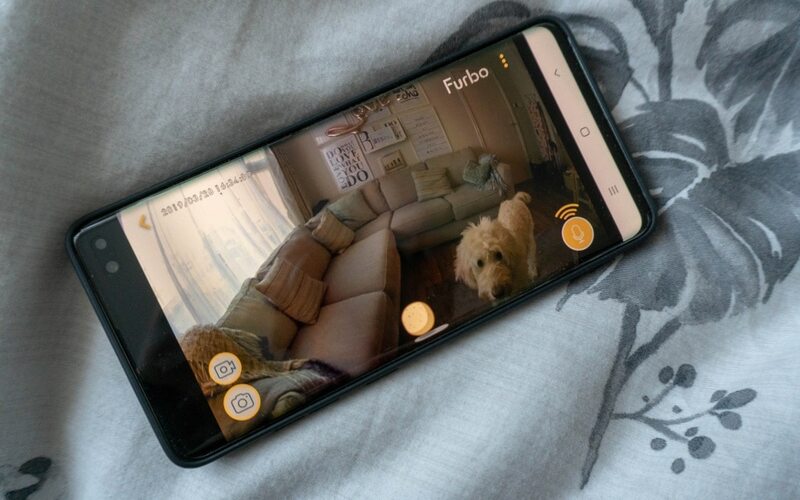 I have been reviewing the Furbo dog camera over the past couple of weeks to see how we got on with it, it’s nice to know that Gus isn’t upset when he’s left on his own, but many dogs are. 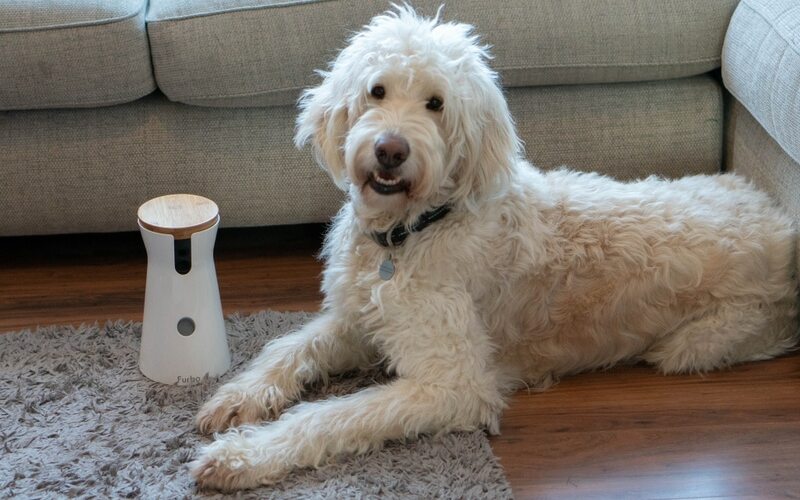 The Furbo dog camera is more than just a dog camera though, it’s a treat dispensing, has two-way audio and a camera! 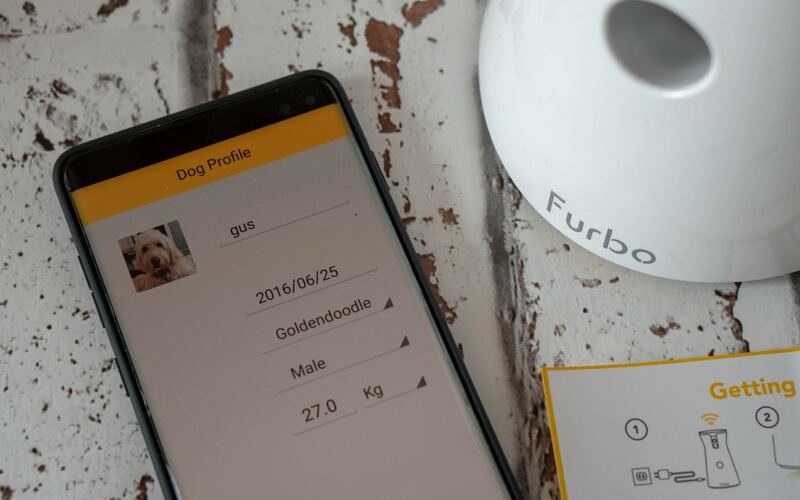 Furbo has worked alongside vets and dog trainers to come up with a dog camera that works well for both you and your dog. Dogs can suffer separation anxiety very easily, they want to be with us but there are times that they can’t be and they do need to stay at home. So it’s important you make this as pleasant as possible from an early age. Gus doesn’t like people coming to the house, postman and delivery men get a bark! I did expect he was doing this when we were out. I have watched him when we’ve been out and when my doorbell alerted me to the postman arriving, and he’s watched him but he hasn’t barked. So maybe his barking is for my benefit or protecting me. However when he stood up and watched I was able to dispense a treat to him from Furbo. This distracted him from what was going on outside and also made it a positive thing the postman was arriving. He then settled straight back down and was relaxed rather than watching out the window. What’s In The Furbo Box? Included in the box is the instructions, main powered cable with plug choices, treats and the Furbo. It’s packaged well and very easy to connect up. 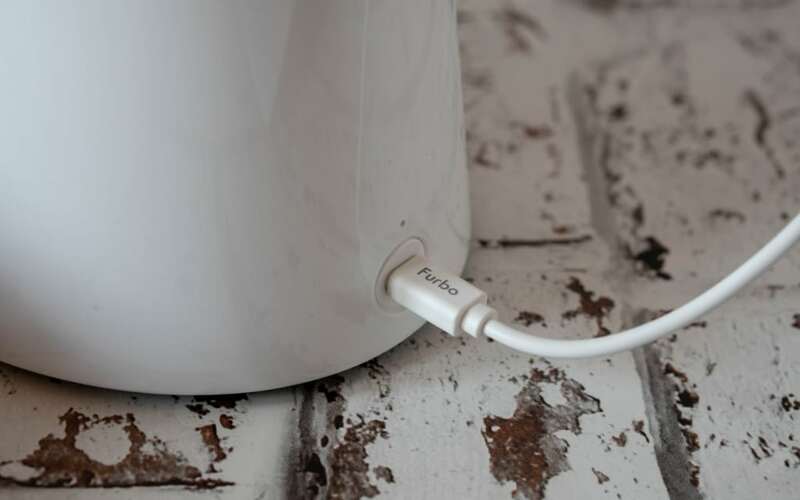 Furbo has a 2-metre power cable to plug into a socket. 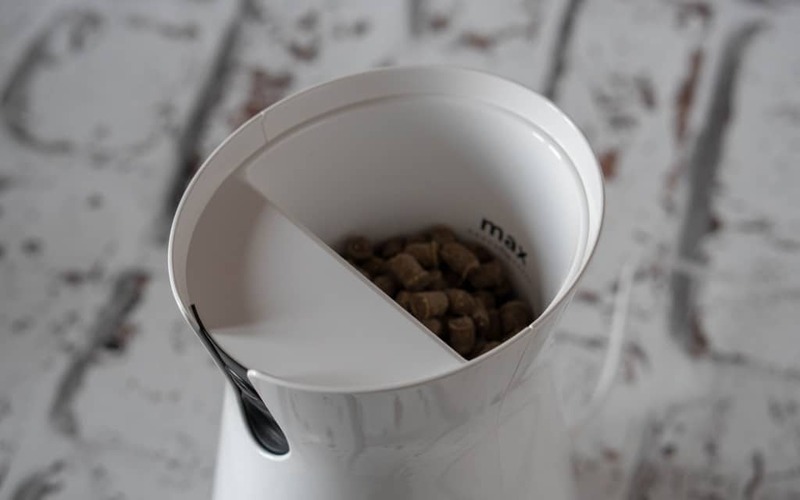 You need to think about where you will be placing your Furbo and make sure your power cable is near enough, your dog will still be viewable and the treats will be able to land on the floor for the dog. I love this function of the Furbo dog camera, and Gus is learning to love it too! When you select you to want a treat dispensed on the Furbo app it will send a noise which is only used when treat dispensing. Like clicker training, a noise means treats and now as soon as Gus hears that noise he will come over to the Furbo and wait for his treats to appear! 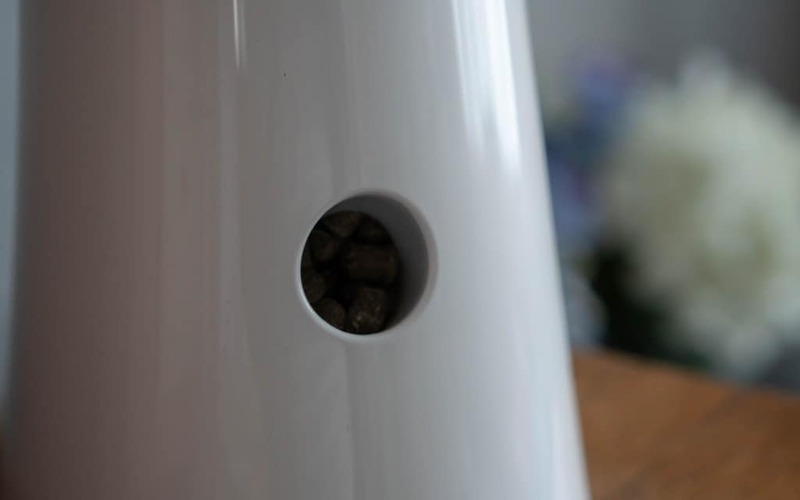 You can add whatever treats you want, it holds around 100 of them and treats with a diameter of 0.4 in/1cm work best. Will My Dog Knock It Over? I have placed mine on the fireplace as it’s near a plug socket, not at Gus’s level and the treats will still land on the floor for him. They also have 3M industrial strength adhesive on the bottom of the Furbo. You do also need two hands to remove the lid which hides the treats! 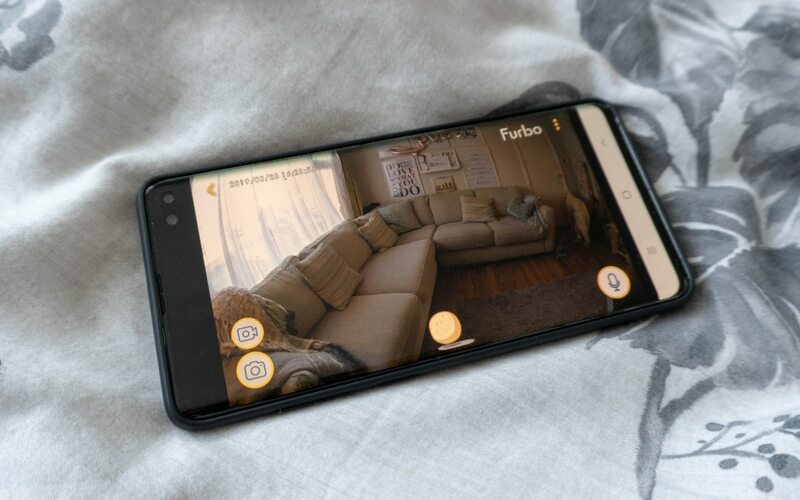 The Furbo is controlled using the App which means you can access the Furbo dog camera from anywhere. It’s very easy to set up and start using within a couple of minutes. You can even set up your dog’s profile on there with a profile photo of them too! With the two-way audio function, you can talk to your dog as well as hearing him too. 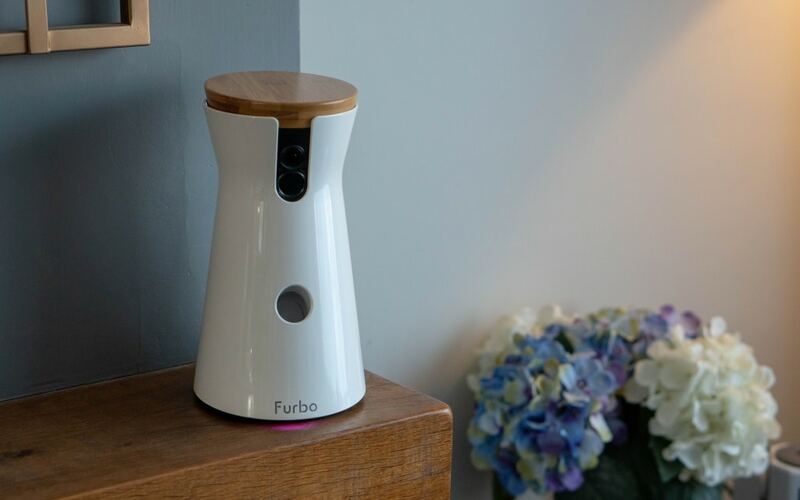 Furbo is very clever and it will send a live alert to your phone when it detects your dog barking. This would allow you to deal with the situation like dispensing a treat to distract him, or talking to him to reassure him. What Are The Lights Underneath? 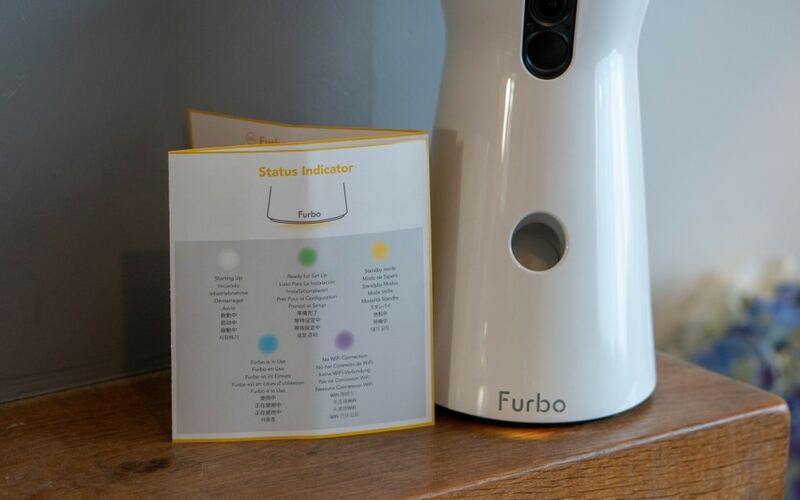 Furbo comes with a range of status lights to let you know it’s status easily. Furbo needs to connect to the internet so it will shine purple for no WiFi connection and yellow for standby mode. All of the different ones are detailed in the book. Furbo has a 1080p HD camera and a 160° (diagonal) wide-angle lens so you’re going to see your dog really well and within a wide space too. If you’re worried about your dog at night time it even has an infrared LED night vision so when you log on and it’s dark you will still see your dog! What Do We Think Of The Furbo Dog Camera? I love it! I am not sure if I will use the voice function too much with Gus when we’re not there, I am not sure for Gus it will be beneficial to him but I love the treat function, bark alert and being able to check in on him when we’re out. It’s very reassuring for us. 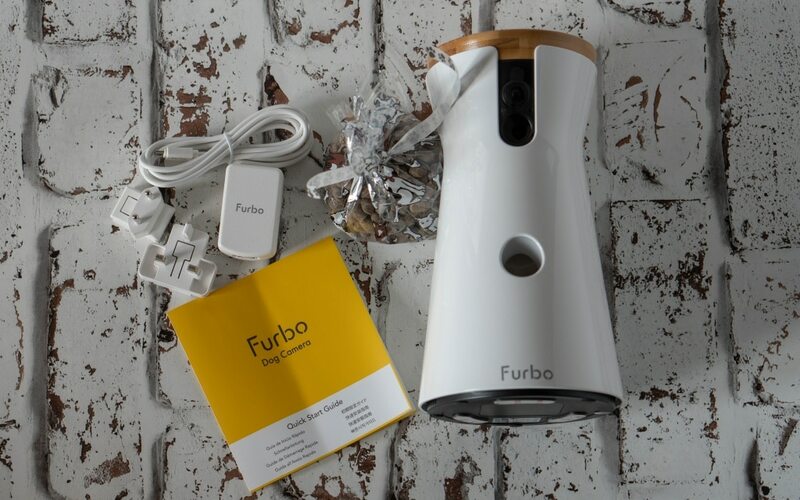 You can purchase a Furbo dog camera from Furbo website or through Amazon too. Yes Gus loves the fact that it gives him treats!! We don’t have any pets, but what a brilliant idea! I see how this could be helpful to pet owners worried about their pets. Hah hah this is absolutely brilliant! What an amazing idea! Great at keeping an eye on them isn’t it! What a good idea to keep an eye on your dog. I bet that makes for interesting viewing! This is such a great idea. I wish we’d had something like this when we had our dog. It’s so cool to check in on him too! What a fantastic device! Our dog used to hate being left alone and would start chewing things up, I often wonder what she’s up to when we are out. I’d love one of these. Gus loves the treats! He comes as soon as he hears the squeak! 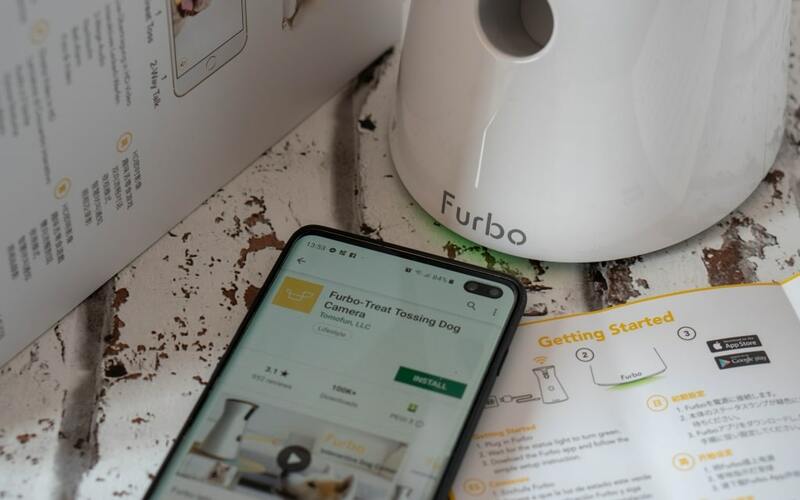 Home » Gus and US » Furbo Dog Camera Review – Treat Tossing Camera!